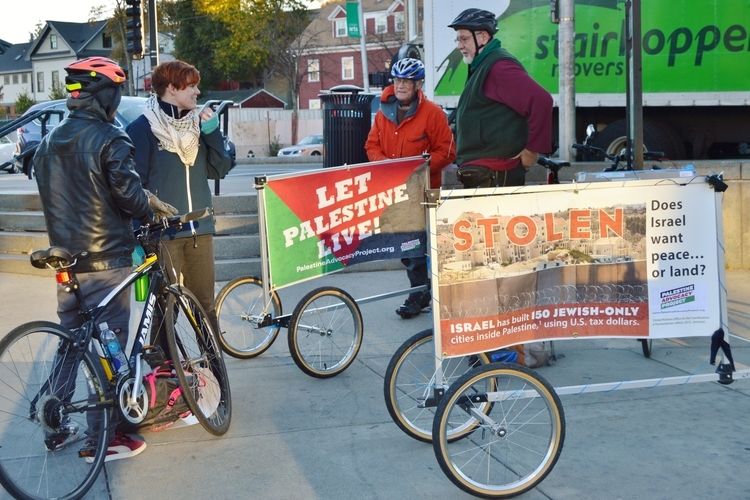 Activists and concerned citizens rode their bikes through Cambridge and Boston last night, bearing messages of solidarity with Palestinians, and advocating for an end in military aid to Israel. Palestine Advocacy Project called the protest in response to the ongoing rise in violence against Palestinians, and were joined by members of Jewish Voice for Peace Boston, American Jews for a Just Peace, Massachusetts Peace Action, Veterans for Peace, and the Boston Coalition for Palestinian Rights. 56 Palestinians and 7 Israelis have been killed since October 1st. Thousands of Palestinians have been injured. On Friday October 23rd alone, almost 300 Palestinian protesters were injured during a national Day of Rage against the occupation. Tensions have been running especially high between Palestinians and Israelis, since a group of settlers led a Jewish prayer service inside the Haram al-Sharif, a site holy to both Muslims and Jews, but is reserved for Islamic worship. Throughout this uptick in violence, the Israeli police and military have repeatedly used controversial tactics, including opening fire on protesters, expediting housing demolitions, curfews, and mass arrests. When Palestinians -including minors – are suspected of reprisal attacks, they been executed without accountability or oversight. Palestine Advocacy Project condemns these measures and considers them to be forms of collective punishment, which is illegal under international law. Despite these developments, the US government has released a plan to increase military aid to Israel by $1 billion annually. The final details of this plan will most likely be decided in the coming weeks. Military aid to Israel pays for the occupation of the West Bank, the siege of Gaza, and the weapons that are currently being deployed against protesters. Protesters yesterday evening declared themselves in opposition to this potential increase in military aid. 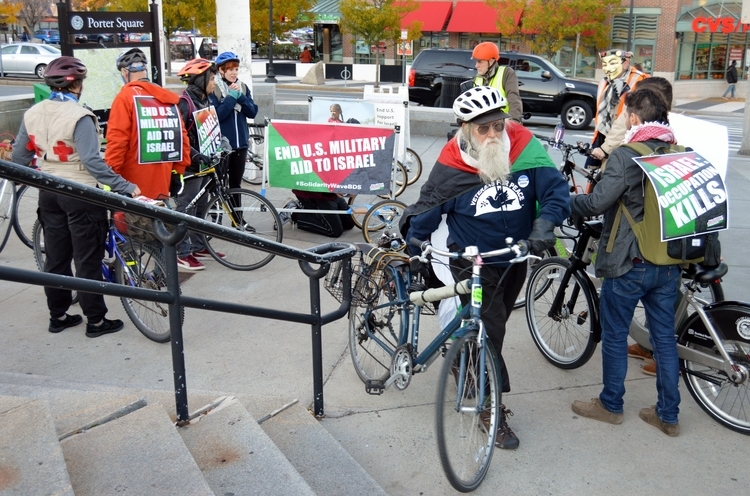 The protest went from 5 until 7 PM, as bikers went from Porter Sq. to Copley Sq., and back again.